Die Therapie endodontischer Notf... Goldstein, Ronald E.
The Science and Art of Porcelain Laminate Veneers is the most comprehensive textbook yet written to detail the expanding field of porcelain laminate veneers (PLVs) in esthetic dentistry. The book examines the role of the esthetic dentist in understanding the needs of the patient and formulating a treatment plan that includes not only esthetic considerations such as color and smile design but also occlusal, periodontal and functional requirements. 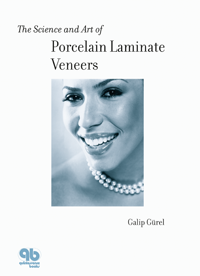 The Science and Art of Porcelain Laminate Veneers discusses PLVs and diastema closure, tetracycline discoloration and orthodontic treatment and includes a chapter on patient education in esthetic dentistry. New techniques to ensure minimal invasive tooth preparation and maximum space creation for the dental technician are explored, and impression materials for PLVs are compared. The guides to alternative porcelain materials and their step-by-step applications make this book an invaluable text for dentists, dental technicians and the entire esthetic team.